The New Pioneer 9 model S331 - 3 wheel Bariatric scooter - This the first affordable 3 wheel Bariatric scooter in its class! The 550 lb. weight capacity, top speed of 8 m.p.h. 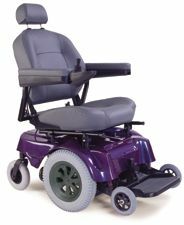 and 22" wide high back, semi reclining seat make the Pioneer 9 stand alone in its class. The many heavy duty features include a 4" ground clearance, 12" drive tires, 10 degree climbing angle, automatic safety speed control decreases speed to half during turning. The extra large group 24 batteries give this unit extra power to handle the roughest of terrains. 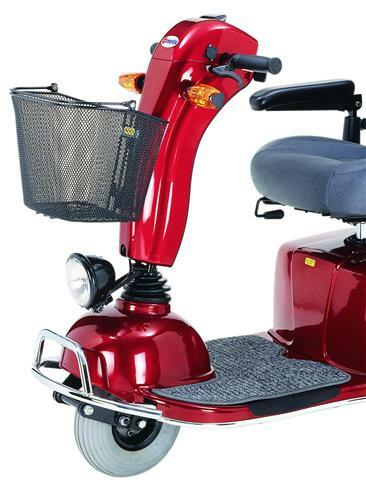 Add to that the extra amenities of full light kit (including head light, tail light and directional signals), swivel seat, removable head rest, flip-up, width adjustable armrest, front basket and much, much more!!!! Heavy duty weight capacity of 550 lbs.!!!! Wheel Size Front 10", Rear - 12.5"
Top speed of 8 mph. with large 12" drive wheels and 4" ground clearance. 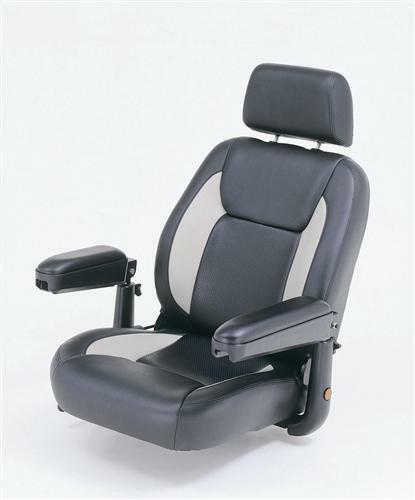 Comfortable high back 22" wide x 21" deep swivel and sliding contoured captains seat with flip-up, height and width adjustable arm rests and removable head rest. 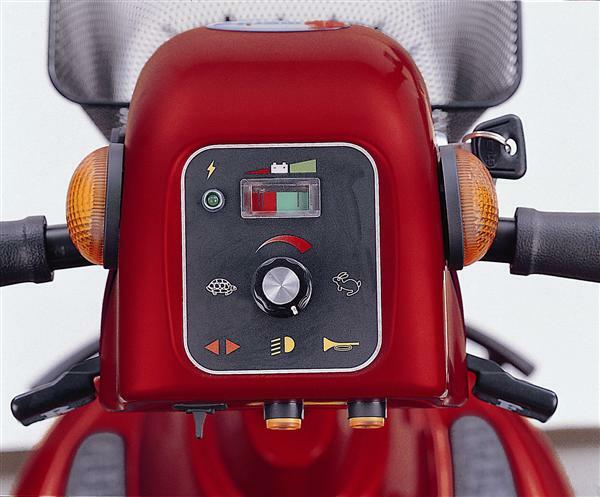 Automatic safety steering - cuts speed of scooter in half automatically when turning. 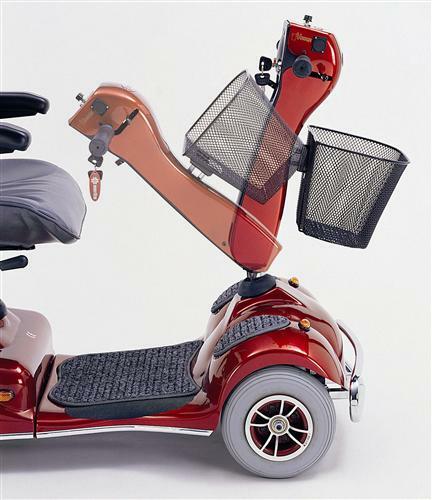 Double automatic safety braking system with safety hand brake attached to durable drum brake. Maximum Speed 8 mph, variable speed control. 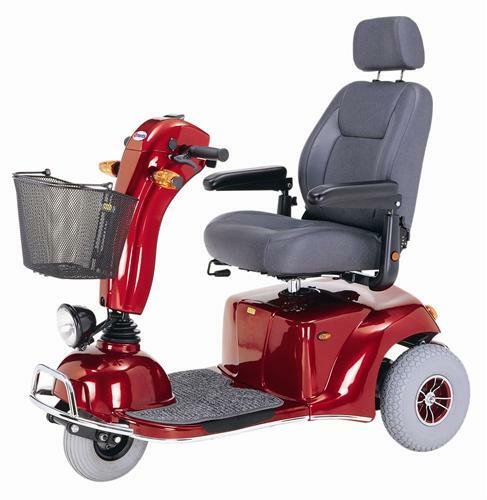 Seat Height to floor: 25" to28"
Infinitely adjustable Tiller Front bumper, head light and basket. Solid, heavy duty one piece frame. Easy to read control panel. High back 22" w x 21" deep sliding, swivel captains seat.